John and I attended the temple at 6 am. We returned back to the motel room at 8:15 and went with the kids to have breakfast. The motel had a self-serve kitchen. We ate cereal, toast, and waffles. After we packed up the van, we drove over to the temple to walk around and take pictures. 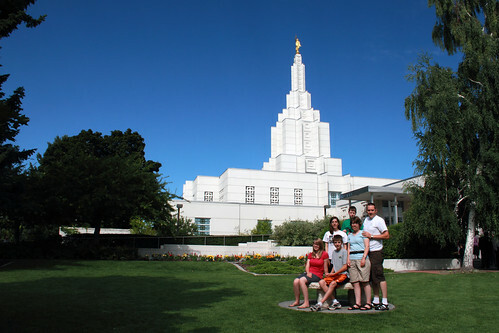 We took a family picture in front of the temple. We told the kids, “This is where it all began.” John also took pictures of the falls. We were off and travelling again by 11am. 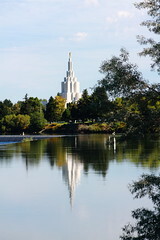 When we arrived in Idaho Falls last night, William wanted us to tell him the story of how we met and came to be married in the Idaho Falls Temple 19 years ago (on Valentines Day). 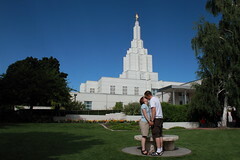 The kids weren’t impressed when John and I kissed for one of the pictures we took in front of the temple. They were smiling, so it must make them happy to know that we still like and love each other. Yesterday, when we were in JCPenny, we saw a t-shirt in the baby section that read “Mom + Dad = Me!” We thought it was cute. 12:18 pm – Entered Montana and crossed the continental divide. Victoria is driving while I rest my eyes. 2:15 pm – Crossed the Continental Divide again. 2:35 pm – Crossed the Continental Divide again. I drove during a hailstorm. I didn’t like it. Entered Great Falls, Montana at 5:00 pm. We are headed for a mall. We shopped at a mall and shopped at Ross and JCPenny. William got a nice pair of dress shoes. It was raining when we left the mall, so we went to a chinese buffet for dinner. It wasn’t that good. For lunch, I made sandwiches for everyone while we drove. We are at the Sweet Grass border crossing at 10:20 pm. Didn’t have any problems getting across the border, but they made us feel guilty. In Lethbridge at 11:30 pm – Need to get Gas. I stopped in Claresholm to get something sweet to keep me awake. It’s just after 1 am. We’re not stopping. We arrived home at 2:30 am. It was nice to sleep in our own beds.